As a health conscious mother of three young children, it can be a challenge to steer them away from the sugar-laden, artificially sweetened cereals at the grocery store. Thankfully, my children enjoy eating foods that are good for them as long as it tastes great too. This is where Nature’s Path organic foods consistently hits the mark with high quality, organic and/or natural foods that can be enjoyed by the entire family. As we approach summer break, we like to eat lighter foods that are good for us, keeps us filled up and will give us plenty of energy for all of those fun-filled activities. Recently, Nature’s Path EnviroKidz has released two new whole grain cereals i.e. 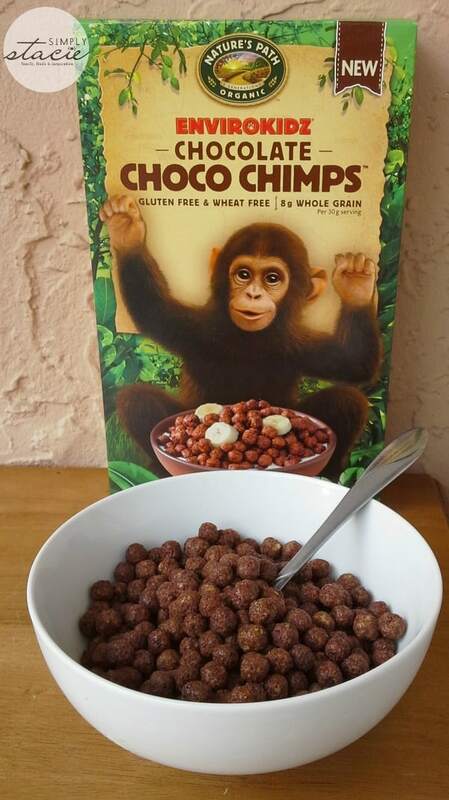 Choco Chimps Cereal and Jungle Munch Cereal. 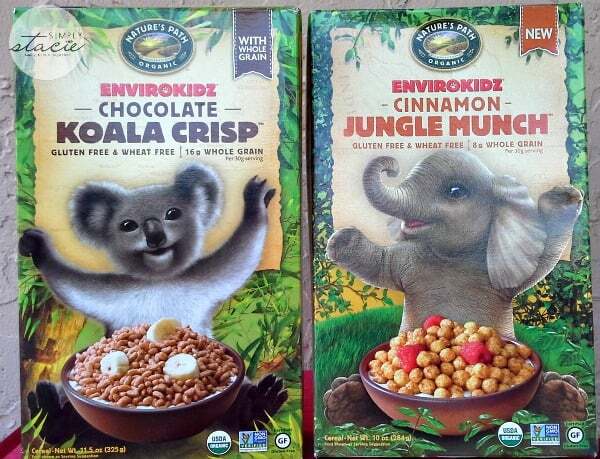 My children’s favorite cereals have been from EnviroKidz as they have enjoyed Chocolate Koala Crisp, Gorilla Munch Cereal and Peanut Butter Panda Puffs Cereal for breakfast (and snacks occasionally) for years. We were very excited to try the newly launched cereals and it was a huge hit with my entire family. When we enjoy EnviroKidz cereals and cereal bars, I can feel confident that there are no GMO’s, no artificial flavors or colors and it is pesticide free making it the healthier choice for my family! The EnviroKidz Choco Chimps Cereal is a delight for chocolate lovers as it features whole food ingredients such as fairly traded cocoa, whole grain corn meal and a touch of sugar. I appreciate that a serving is not too sugary with 9 grams per ¾ cup serving and it has 2 grams of filling fiber and 2 grams of protein too. Like all of the EnviroKidz cereal boxes there are no junk toys that go straight to the trash. Instead my children enjoy learning more about the featured endangered animals from around the world as they read the interesting facts and activities on the back of the box….they love it! I appreciate that EnviroKidz is environmentally conscious too as it is a 1% For the Planet member so every time we purchase an EnviroKidz product, 1% of the sales is donated in order to support endangered species and their habitats. One of the contributions includes The Jane Goodall Institute which is dear to our hearts as my 9 year old son and I met this amazing women at the premiere of the Disney movie, Chimpanzee. Ever since, my son has wanted to learn more about the plight of chimpanzees and how he can make a difference in order to help them. This is one way to do it because Nature’s Path EnviroKidz has raised $1.4+ million dollars for all of their partners thus far! EnviroKidz Cinnamon Jungle Munch is another new favorite which features a delicious cereal that stays crunchy with a hint of brown sugar, molasses and real cinnamon. My daughter has declared this her favorite cereal and this is a big deal for her because she does not care for cold cereal like her brothers do. She enjoyed telling us about “What it is like to be an elephant” from information that she learned from the cereal box and said that she “loves” Jungle Munch because it “tastes so yummy”! For a snack or dessert, my kids also love the EnviroKidz Berry Blast Crispy Rice Bars which are much tastier than those “other brand” bars that are full of junk ingredients. These gluten and wheat free bars have only 6 grams of sugar but are a satisfying treat that always brings a smile to my children’s faces. I confess that I enjoy it too because I am trying to cut way back on sugar consumption and this hits the spot when I have a craving for something sweet and want something that doesn’t have a ton of sugar. You are invited to visit Nature’s Path to learn more about the EnviroKidz product line and check out the delicious options for adults too including some of my personal favorites such as the Nature’s Path Love Crunch Aloha Blend Organic Granola which is packed coconut, white chocolate chunks and pineapple. “Oh my”, words simply do not describe how delicious this granola tastes on yogurt, with milk or by the handful (my preference). There are also lots of gluten free selections including the Sunrise Crunchy Honey or Cinnamon cereals (my husband enjoyed these for breakfast in the morning). One new product that I tried and loved recently is the Qi’a Superfood Chia, Buckwheat & Hemp Cereal in Cranberry Vanilla flavor. I really like Chia in my oatmeal or yogurt so I was interested to taste this cereal and it was delicious and packed with 6 grams of protein, 4 grams of fiber and 19 grams of ALA OMEGA 3’s. These are just a sampling of the many delicious options available from Nature’s Path….it just proves that you do not have to sacrifice on taste in order to eat healthy! they are located in british columbia! I would like to try the Optimum Power Blueberry Cinnamon Flax Cereal. I would love to try the smart bran wheat raisin cookies! I would love to try their Ancient Grains granola with Almonds! I like that they are GMO free. I like how they have many vegan options. I didn’t know they have gluten free granola bars! How awesome! I would love to try the Macaroon Crunch Bars from Natures Path. I would like to try the Love Crunch® Dark Chocolate & Red Berries. I like the Love Crunch® Dark Chocolate & Red Berries. i like the recipes that they have on the website. I learned that at Nature’s Path they believe you should know what you’re eating. That’s why they voluntarily have their products third-party certified organic and Non-GMO Project verified. I really like their vanilla granola! I like that they offer Buckwheat Wildberry Frozen Waffles. This is a product I could sink my teeth into on a regular basis! 😉 Thanks. I like the Flax Plus® Pumpkin Raisin Crunch cereal! The gluten free granola bars would be great for my daughter to take as a snack to share at school. There is a gluten allergy in her class! I love the variety. There are so many things I want to try! Fair Trade (also known as “fair trade” or “fairly traded”) refers to the broader concept of fairness and decency in the marketplace, whereas “Fairtrade” refers to the specific Fair Trade certification system run by Fairtrade International (FLO) and its members. I would like to try the Macaroon Crunch. I learned that they have awesome recipes. I like Banana Maple-Pecan Pudding. I like that they are fair trade. 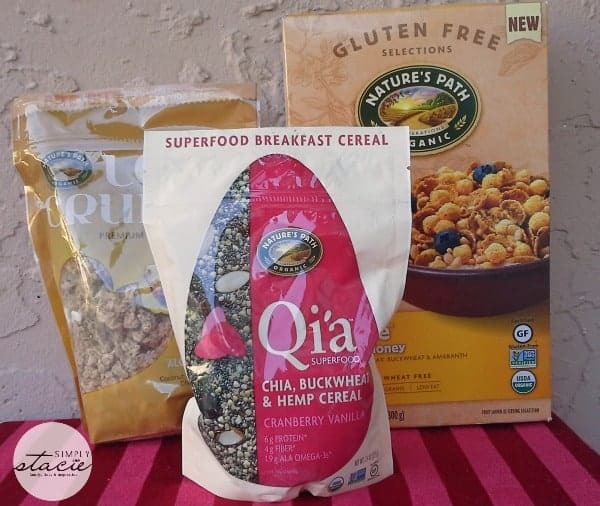 we are big fans of their gluten free cereals. I like their GMO products. Love Crunch® Gingerbread I would love! I like that you can search their products by special diet and I like that they have a lot of vegan products. I learned that they make crunchy granola bars, not just chewy ones. I want to try the Macaroon Crunch. I like that they give grants to help community food gardens. I like the Mesa Sunrise Flakes. I learned that their products are USDA Certified Organic, Non-GMO Project Verified and Vegetarian. I like that they have so many vegan products, and I’d like to try them all!! I love their vanilla granola! I am always looking for healthier options for my family, I like how this company has gmo free food. I am so excited to try some of the recipes on the site. Banana Maple-Pecan Pudding sounds so good, my girls love their cocoa rice bars, I do to! My favorite is their Flax Plus® Pumpkin Raisin Crunch cereal. I love that they make oatmeal. Would especially enjoy the Cranberry Ginger Oatmeal flavor!